Most people running for political office are not asked how they will physically do the job. But for Tony Clark, it is one of the most common questions he is confronted with. Clark is hoping to be the first blind person elected to the Federal Parliament. He spoke with Xavier Smerdon. At 195 centimetres tall and with a booming voice, there are plenty of things about Tony Clark that are likely to grab people’s attention. But it is the disability he has lived with since the age of 20 that most people take notice of, and Clark could not care less. Clark is Labor’s candidate for the seat of Deakin in the next Federal Election, hoping to become the first blind Federal politician in Australia. ?Deakin is the most marginally held Liberal seat in Victoria, with the party winning 53.2 per cent of the two-party-preferred vote at the 2013 election. Losing his sight at the age of 20 from a condition called Retinitis Pigmentosa, Clark said he viewed his blindness as a strength rather than a weakness. “I used to play cricket and I started to lose the ball in the field when I was about 14, but I wasn’t diagnosed until I was 19,” Clark said. “It took me two years to come to terms with it. There were two years there that I didn’t want anyone to know because I was frightened of sympathy. I did not want sympathy. It took two years to embrace it for what it was. 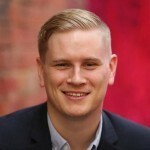 After studying immunology at university and obtaining a Masters Degree in Communications, Clark worked at a range of Not for Profit organisations, perhaps most notably at Vision Australia where he developed commercially sustainable business models. But since announcing his plans to become a politician, one of the most common questions Clark has faced is how can a blind person possibly do the job. Rather than be offended by the question, Clark has embraced it and is determined to alter the public’s misconceptions. 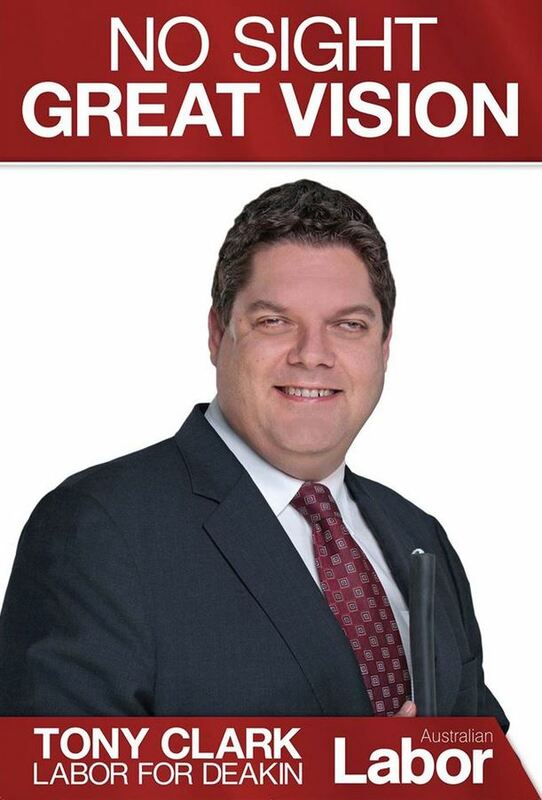 His campaign poster featuring the slogan “No Sight, Great Vision”, shows off his sense of humour and has started to go viral. “There are no doubts in my mind I can do the job,” he said. “I want people to ask the question. I’m not frightened of my blindness and I’m not offended by people questioning my ability, I just want to prove them wrong. “You’ve got to play with the cards you’re dealt in life and so I’m playing with mine and I choose not to look at my blindness as a disadvantage, I choose to look at it as an advantage. So as such, I’m very keen for people to ask me questions about my blindness and for me to able to break down those barriers and that lack of understanding and the fear that we have within our community. “I haven’t had a negative comment yet but I’m very prepared for them to come. If someone wants to have a discussion about it then I’m happy to talk to them. Clark showed Pro Bono Australia News the mobile technology he uses to read news articles at great speed. A few taps of his phone and it starts reading news stories at an incredible speed. The average person cannot make sense of the words coming out of the phone but Clark has trained his ears to keep pace. “Technology has come miles. I can send you a text message faster than you could text it. Anything that I can access on my phone or my computer I can read. The technology gives me full access,” he said. As for his policies, Clark is a member of the centre-right faction of the Labor Party. He said he supports gay marriage, greater transparency in the Not for Profit sector and quotas for disability employment. “I think there are some enormous challenges like employing people with disability and the Government has got to take the lead,” he said. “We keep on talking about it, we have forum after forum, we have talkfest after talkfest and the Government has got to draw the line and say, ‘you know what, we’re going to set quotas on disability employment’. “We need to look at what the United States does where they actually provide all of their elected Congressman and Senators with the opportunity to employ someone with disability in their offices with no impact on their entitlement, so they can then get an extra staff member. That will then start the learning and start our policy makers to understand that this is not a barrier and to understand the issues facing people with disability. Clark said he was ready to become a role model for people with disability but that was not the only reason he was entering politics. “We don’t have anyone with a disability in the Federal Parliament, yet 20 per cent of the population has a disability,” he said.